While this second edition retains the successful didactical concept of its predecessor, all the sections have been thoroughly revised, updated and expanded, with two major new topics, plus 50 additional questions - in total around 20% new content. 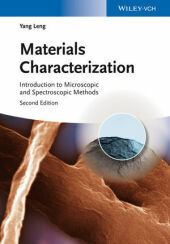 Now in its second edition, this continues to serve as an ideal textbook for introductory courses on materials characterization, based on the author's experience in teaching advanced undergraduate and postgraduate university students. The new edition retains the successful didactical concept of introductions at the beginning of chapters, exercise questions and an online solution manual. In addition, all the sections have been thoroughly revised, updated and expanded, with two major new topics (electron backscattering diffraction and environmental scanning electron microscopy), as well as fifty additional questions - in total about 20% new content. The first part covers commonly used methods for microstructure analysis, including light microscopy, X-ray diffraction, transmission and scanning electron microscopy, as well as scanning probe microscopy. The second part of the book is concerned with techniques for chemical analysis and introduces X-ray energy dispersive spectroscopy, fluorescence X-ray spectroscopy and such popular surface analysis techniques as photoelectron and secondary ion mass spectroscopy. This section concludes with the two most important vibrational spectroscopies (infra-red and Raman) and the increasingly important thermal analysis. The theoretical concepts are discussed with a minimal involvement of mathematics and physics, and the technical aspects are presented with the actual measurement practice in mind. Making for an easy-to-read text, the book never loses sight of its intended audience.